There is nothing quite like a cold Presidente, Bohemia, Brahama or Quisqueya Cerveza (for more information on the breweries and their start go to our products beer/cerveza page). These cervezas/ beers are also called by other names. Before if you wanted a Presidente (this, the most popular of the Dominican Republic brews and it is said to represent the real spirit of the Dominican people, the soul, the joy of living in this lovely country) all you needed to ask for was a bien fria, or just a cerveza. Now with a few different popular brands you need to be a bit more specific. Especially with the introduction of Presidente light, now when you ask for a Presidente you will usually be given a light beer unless you specifically ask for a "normal". Beer is also refereed to as "Vestida de Novia" (dress of the bride), called this for the layer of ice covering the bottle. Ask for una fria (a cold one) or a bien fria (good and cold). It is always nice to get a "grande" or a "jumbo", which are larger bottles, and a few glasses. This way you can share with others. It's a great way to meet people when your having a beer in a Colmado by offering a glass to those around you. It is a topic of much debate that Presidente beer tastes different in USA than it does in Dominican Republic. It is true that if you do drink a Presidente outside of DR it tastes different. Maybe because the temperature of the beer served on the island is as close to freezing as it can get. People say the alcohol content in the beer in USA is less. or that one can get a buzz faster on the Dominican served beer, but this is really not true. The only real difference between exported and local Presidente is the bottle and the label. The beer inside the bottle is the same. There have been many tests conducted by Presidente themselves and it seems that the difference in taste is all psychological. Whatever the reason and by whatever name you call it, ( bien fria or vestida de novia), an ice cold beer tastes great in Dominican Republic. There is nothing like it in all the world. You can see people sitting at an outside table at a restaurant consuming. Sitting in a park there are people imbibing. In a Colmado there is usually always someone holding on to a glass with a liquid inside. Doesn't really matter at what time of day (many do drink a beer for lunch or on a break from work. 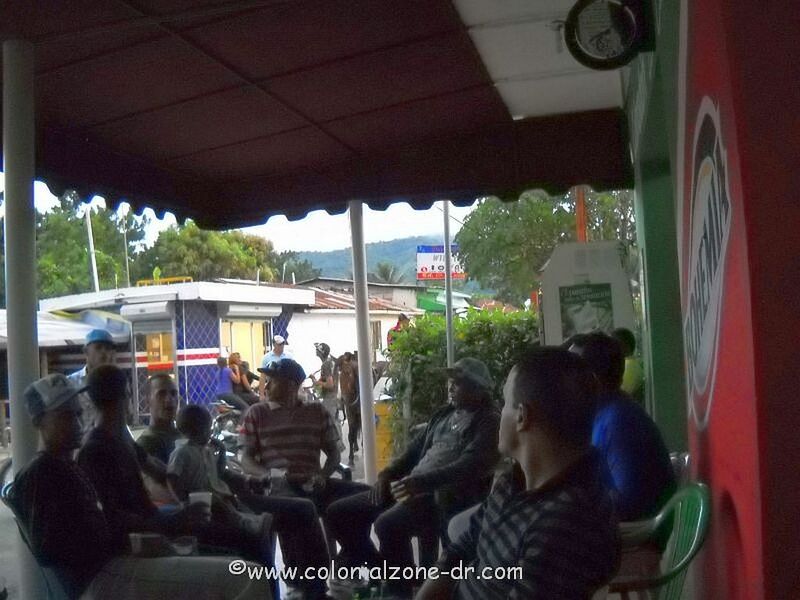 Here in Dominican Republic there is always someone enjoying with a cold drink in hand. Is it because of the hot temperature of the island and this is the most refreshing drink to cool the body? Is it because it is readily available? No one can be sure. But, it is a for sure, that a cold one sure does taste good on a hot day. When you buy a bottle of rum in the Colmado just ask for a styrofoam glass with ice in it. Get a mixer, 7-up or Coke and make your drink right there and enjoy. It is much cheaper than going to a bar to have a drink and can be much more fun. There are many varieties of Dominican Ron/Rum that you can enjoy. Dominican rum is very tasty and the amber ones can even be enjoyed without mixers. To learn more about the run/rum produced here in Dominican Republic go to our products-rum page here. It is said that the National pastime in Dominican Republic is drinking. Dominicans seem to drink alcohol and water equally. It is normal to see the plastic glass filled with beer and the styrofoam glass filled with ice and rum. It is very difficult to say which drink is the favorite among the people as they are equally consumed by all. The Dominican Beer Producers Association (ACOFAVE) says that the industry generates RD$14 billion in revenue annually (equal to about 2.1% of Dominican Republics GDP). The beer industry employs more than 100,000 people directly of indirectly. ACOFAVE members include Cerveceria Nacional Dominicana, Cerveceria Vegana, Cerveceria Bohemia and Ambev Dominicana (Dec. 2008). More info on these companies and Dominican beer here. Buy these designs on a T-shirt or other apparel. Just click on the design and it will take you to that article or you can easily create your own designs. Make one shirt or make many to sell yourself. This is a video of a Presidente Cerveza/ Beer commercial. Wouldn't you like a bien fria right now?! When you have a hangover / resaca here in DR which is sure to happen sometime or another, here as in anywhere, you need some of the "Hair of the dog that bit you" to clear it up. If you tell them about the hair of the dog (needing another beer to cure the hangover from the day before) they will most likely look at you like your crazy. Here the proper way to say it is "Un clavo saco otro clavo" (literally meaning "one nail raises another nail"). People will think you are a real local if you use this saying. They also sell pills for a hangover in most Colmados just say you have a resaca and they will give you the right little envelope. It is interestng to learn that drinking has been a past time here in Dominican Republic since forever. I came across this sign in a business in Zona Colonial and did a little research as to where it came from. It is part of the writings of Sir Andrew Halliday (also spelt Hallidie; 1781-1839). He was a Scottish physician, reformer, and writer. This quote came from his 1837 book Account of the West India Islands. The temptations that surround the traveler on his arrival in these islands are great. And the incitements to indulgence almost overpowering, yet they must be resisted…. "..On first landing, the craving desire for liquids is almost incessant, and most distressing; and the more the traveler drinks the more his desire for drink increases, and by indulging his depraved appetite, there arises that vicious habit of tippling in the morning which too often ends in confirmed drunkenness..
"The climate of the West Indies is neither favorable to mental energy, nor conductive to moral habits; and more especially, if the monotony of the same pursuits and indulgences be superadded."